I hope you all had a lovely Fourth of July and that you had a day off of work at the very least. If there’s one thing I think many of us need more of it’s a little rest and relaxation. We had a nice mellow day with friends and no work all day at all. Nice. In fact, I even watched a little tv while I was putzing around the house before going out. Computer time has wiped out my tv time in the last few years, so watching tv is a real treat for me. Although it’s funny that when I have time off from work (i.e. cooking), I choose to watch the Food Network or the Cooking Channel. I have my favorites to be sure, but some of the really popular shows I just don’t get. Can anyone explain the appeal of “Chopped?” I’ll tell you one thing — it’s not “reality” tv. What’s reality about being given a bunch of ingredients not normally found in a regular person’s pantry and being forced to have to make something tasty out of it given the resources of an unbelievably stocked pantry? I have learned so much from watching Ina and Giada and Tyler, but there isn’t much I get out of seeing what three chefs can do with graham crackers and squid in 30 minutes. Does that show talent? What do you think? Let me tell you what I think takes some skill — making dinner for my family on a typically insane weeknight. You think the judges on Chopped are tough. Ha! They eat everything, even cheese, unlike Mr. Picky. Try making dinner for Daughters #1 and 2 and Mr. Picky under a time constraint. During the girls’ finals week earlier last month, I had a day that did not go as planned and I found myself in a dinner prep predicament. We always eat dinner together every night around 6:30/6:45 and I thought this was one of those nights, but no. Daughter #1 had a study group at 6:30 and Daughter #2 switched her music lesson without telling me and she would be coming home at 6:15. I found all of this out at 4:30 and I had soccer carpool to do. Oh sure, easy, right? Do the contestants on Chopped have two teenage girls yelling at each other about the last ugly photo one posted of the other on Instagram? They do not. And Mr. Picky is not bouncing a basketball in the kitchen while the chefs are trying to figure out what to make for dinner very quickly with the contents of a very basic pantry. Bounce, bounce, bouncety-bounce! Ok, think. Do some prep now, then you have 15 minutes when you get back from soccer drop-off before driving to music. “But the picture you posted of me was much worse than the one I posted of you!” Bounce, bounce, bouncety-bounce! I have chicken, tomatoes, white rice is fast, thank goodness I washed lettuce yesterday. “Mommmmmmm, did you see what she’s getting away with? So many people liked that picture already!” “Really? They liked it? That’s good, right?” “OMG, Mom! No they didn’t like it! Make her delete it!” Bounce, bounce, bouncety-bounce! I can bread the chicken now and bake later. “I am NOT letting her drive me to school anymore.” Whoa there, missy. Now you’ve got my attention. “Delete it this minute!” Bounce, bounce, bouncety-bounce! “STOP PLAYING BALL IN THE HOUSE, MR. PICKY!!! !” Can you imagine doing this sober? Why don’t I drink? I need to rethink that. I know this isn’t just my house, or maybe it is and I am deluding myself. But I think a lot of home cooks have skills that you just can’t learn in culinary school or by watching some pros on tv. I managed to pull something together that night that we ate at exactly 6:15 and we all liked it! I would have likely gotten “chopped” on tv for something so unoriginal, but this is the kind of food we like to eat and it’s reasonably healthful. One of the reasons this worked for me that night is because I was able to bake the chicken instead of sautéing/frying it. 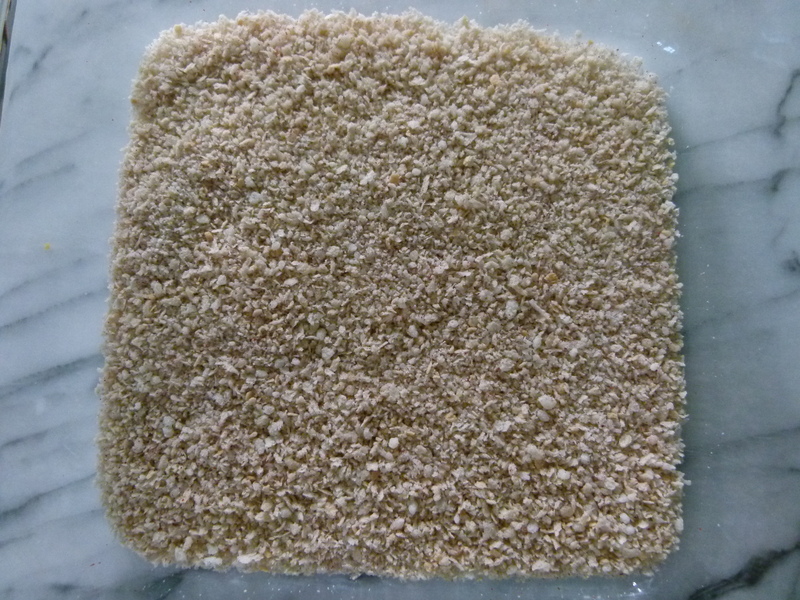 I didn’t know if it would work, but I learned the technique of getting crispy breading by greasing up the chicken with some fat before dredging it from an old Gourmet magazine recipe. That way, I didn’t have to babysit it on the stovetop, plus baking is more healthful than frying and MUCH less messy! This would also be a great method to use when cooking for a crowd. Speaking of cooking for a crowd, for the next episode of “Chopped,” I’d like to see a challenge where the chefs have to prepare a dinner party for 12 guests in Los Angeles. “Oh, sorry, no gluten for me.” “If you don’t mind, I don’t eat dairy. Or meat. Or eggs.” “I’m easy. I eat everything except nuts. I am deathly allergic to all tree nuts. Deathly!” Now that’s something I would watch! Preheat oven to 425 degrees. Brush a baking sheet generously with olive oil. You can line your baking sheet with parchment paper if you want and then brush the parchment with oil. 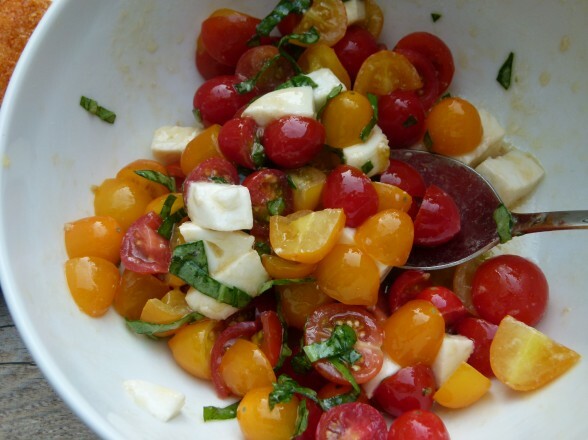 In a medium bowl, combine the tomatoes, mozzarella, 2-3 tablespoons olive oil, garlic, basil and ¼ teaspoon salt. Set aside. In a shallow dish (such as a pie plate), combine the bread crumbs, cheese, and paprika. In another shallow dish, pour a few tablespoons of olive oil. 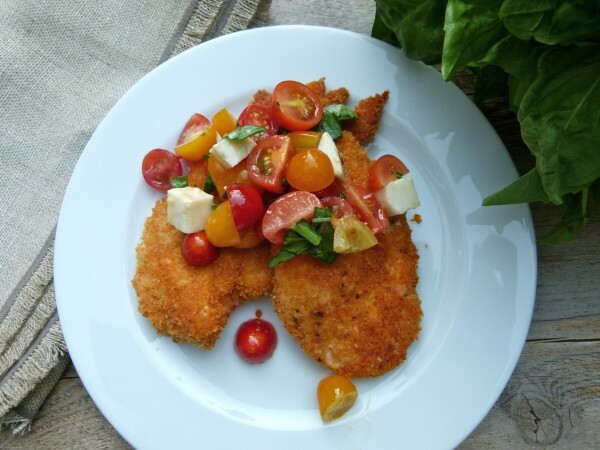 Slice the chicken crosswise in half so that you have two thin cutlets. Check out this post for a visual on what I'm referring to. You can remove the tenders if you wish and coat those separately. Sprinkle one side of the chicken pieces with ½ teaspoon of salt and ¼ teaspoon of pepper. This is the total amount of salt and pepper for all the chicken. Dip the seasoned chicken first into the olive oil and turn to coat. 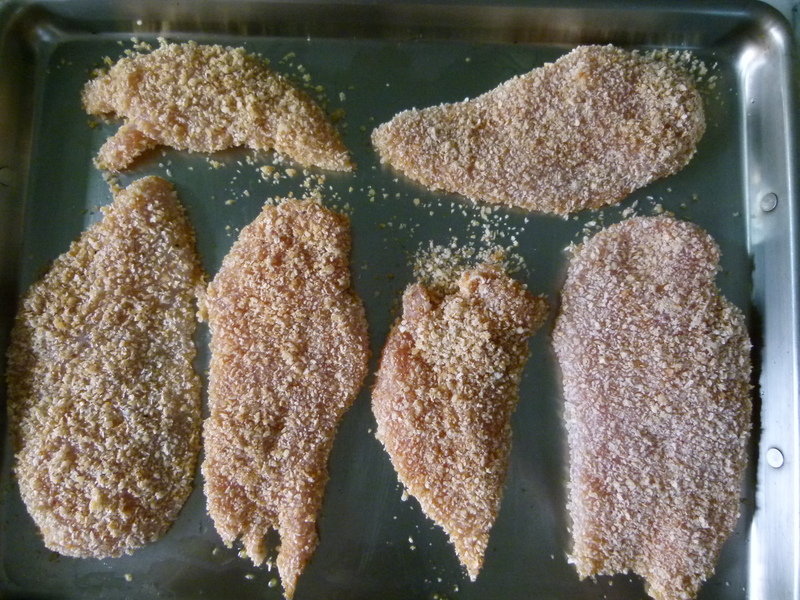 Then dip chicken into the breadcrumb mixture and press to coat both sides completely. Place the breaded chicken pieces on the prepared baking sheet and bake for 15 minutes. 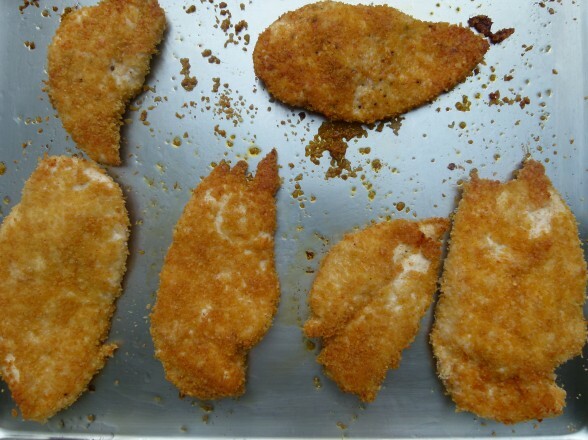 Turn chicken with a spatula, not tongs which might break the breading, and bake another 3-5 minutes or until cooked through and golden brown. Remove garlic cloves from tomato mixture and discard. Spoon tomato mixture on top of chicken. This serves our family perfectly with no leftovers, but we're not big meat-eaters. 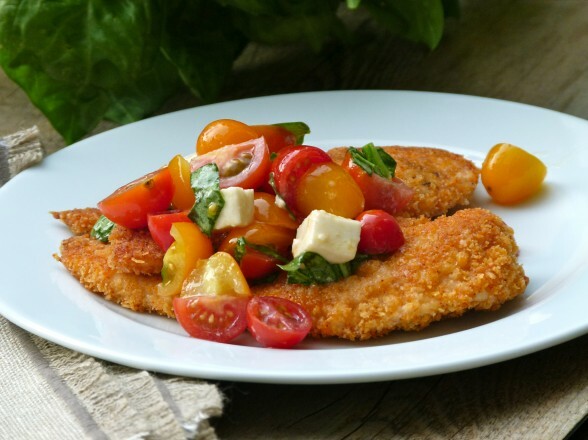 If one chicken cutlet is not enough per person, then increase the chicken and breading ingredients. Hi Pamela – I made the chicken last night for my mr and mr and mrs picky (hubby included!) and they all ate dinner and loved the flavor so that made me happy. But they all thought it was a little soggy in spots. Anything I can do to solve that? Glad they liked it at least! Make sure your chicken is not wet to start and that the olive oil is evenly distributed over the chicken. DOn’t crowd the pan. Hope that helps! This was so delicious and easy. My family loved it so much that ate all the leftovers that was supposed to be their lunches! I had to make a second batch which was also easy since I had leftover Panko mix. One thing I did that made it even easier was to put salt and pepper in my Panko mix instead of individually sprinkling on each chicken piece. This is going to be a family dinner staple. Thank you. Pamela! I love this recipe but the last two times the breading has stuck to the parchment paper (!!) do you have any idea what I’m doing wrong or different? Also, can you make them in the morning to bake at night? Hi! If you oiled the parchment I don’t see why the breading would stick. That is perplexing. I’m sorry I don’t have an answer for that one. Yes you could make these in the morning to bread at night, but I would advise storing them in the fridge in one layer and not stacked on top of each other. this has become a family favorite & recently my husband and i have dropped gluten out of our diet — will this work with any other alternative flour? Just look for gluten-free bread crumbs. Should work just fine! With the tomato mixture how do I remove the garlic if its chopped and mixed in? I didnt read ahead of time and started following the steps and now the garlic is too chopped and impossible to remove. Hi Andrea, The garlic is supposed to be “crushed,” which I mean to be taking the garlic and crushing it under a knife so it’s still in one piece, but flattened. That you could remove. If you minced the garlic, just leave it in there. The tomato mixture will have more of a garlic flavor that way, but it will still be delicious! Oh crushed like that haha Im somewhat new to cooking with fresh garlic. Thank you Pamela. I’m making this for some friends tomorrow night. What do you think I should serve with it? I love questions like this! I would serve this with smashed potatoes and grilled broccolini, both recipes are on my site. Or sauteed kale or spinach. Cauliflower-mashed potatoes would also be good. Minestrone soup is also good with this. And you can’t go wrong with a green salad with one of my everyday salad dressings! Let me know if you have any other questions! I want you to know how you have changed my life. I cook for a family of 8,,with 5 young people. a friend introduced me to your site 2 weeks ago,,and my life just got a lot easier! your recipes are a huge hit with everyone in the family,,and not time consuming. 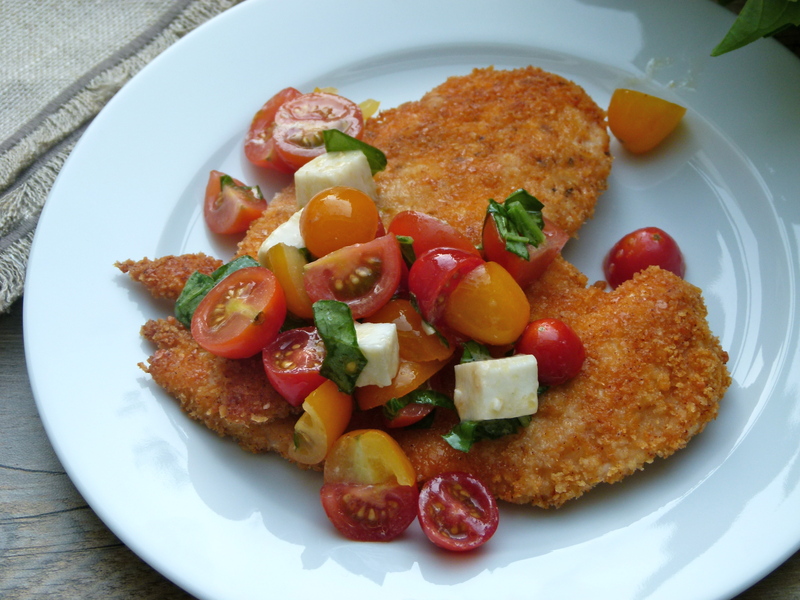 we just finished your chicken caprese-16 breasts to bake. they are so pleased. Chicken cutlets ala bon appetit mag (approx. march 2013) saved my soul during finals. Love that I breaded them in advance. Absolute fav for the family. That was a good tip to freeze them! I should try this method and freeze the cutlets before baking them to see how they turn out. Thanks for the reminder! Everyone in my family loves this. It’s a no-brainer! Hope your crew enjoys it! This post made me laugh out loud! It’s so refreshing to take cooking advice from someone who “gets it,” Thanks Pamela! I have a Mr Picky (my husband) and he couldn’t stop talking about how much he loved dinner. (Who doesn’t love breaded chicken?) He doesn’t Iike tomatoes so I made a spinach salad for him. Such a shame because the caprese was a perfect topper. A win-win for all! Those Mr. Pickys are here to keep us on our toes! Glad dinner was a success — nice job! Thank you for adding your perspective, Erica! Made this tonight with tomatoes fresh from my garden. So easy and delicious! Thanks!!! Fresh tomatoes from the garden….sigh. How nice. Glad you were able to enjoy them in a yummy way. Thanks, Karen! This looks delicious Pamela, will have to try! I love the cooking shows but Chopped, not so much! A normal family meal is much harder to prepare,( with all of the schedules and particular tastes) than anything on Chopped. I sometimes used to feel like a short order cook! So you know what I’m talking about! “Where is the cooking show where the babies are hanging on your legs screaming about Popsicles while you’re microwaving a vegetable?” Haha!! Exactly what I’m talking about. Thanks for sharing, never saw that before!